A hookah (Hindi: हुक़्क़ा, Urdu: حقّہ hukkah) or shisha (Arabic: شيشة‎) is a single or multi-stemmed (often glass-based) water pipe for smoking. Originally from India, hookah has gained immense popularity, especially in the Middle East and is gaining popularity in the USA, UK, Canada, and elsewhere. Today, some of the highest quality and most extravagant hookah pipes come from Egypt, Iran and Turkey. 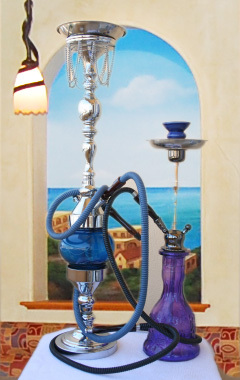 The hookah operates by water filtration and indirect heat. Join us at Waterfront Pizza to smoke hookahs and relax and enjoy a mouth watering meal and a delicious glass of Napa Valley wine. 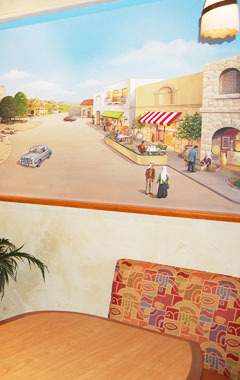 We offer a wide selection of flavors and customized mixed flavors.